17 Nf6 gxf6 18 Qxh6+ Kg8 19 exf6 Resigns. 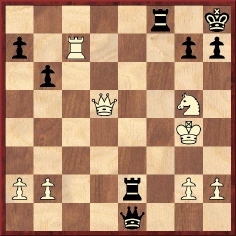 A computer check shows that after 19…Nf5 White would have given mate in, at most, eight moves. 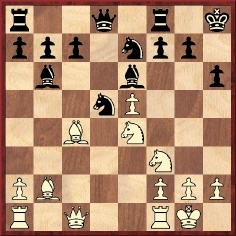 11 d6 Ng6 12 Bg5 Nf6 13 exf6 gxf6 14 Bh6 Re8 15 Qd5 Re6 16 Qxa5 Rxd6 17 Nc3 b6 18 Qf5 Rc6 19 Qd5 Rxc4 20 Qxc4 Bb7 21 Qg4 d5 22 h4 Bc8 23 Qg3 d4 24 Rad1 Qd6 25 Qxd6 cxd6 26 Rxd4 Resigns. Source: Brentano’s Chess Monthly, November 1881, page 322. 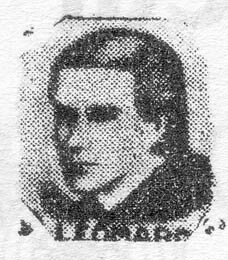 Another victim during Leonard’s short career was William Horner, who had been the victor in the Minor tournament at New York, 1857 while Morphy had been winning the main event. 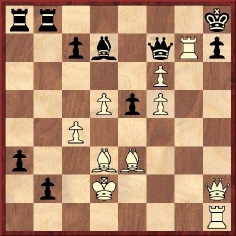 17...Nxf2 18 Bxf2 Rxf2+ 19 Rxf2 Rxf2+ 20 Kxf2 Bxd4+ 21 Kf3 Bxa1 22 White resigns. Source: Brentano’s Chess Monthly, November 1881, page 323. 25 c6+ bxc6 26 Nc5+ Kxd6 27 Ba3 Rfe8 28 Nxe4+ Kd7 29 bxc6+ Kxc6 30 Rac1+ Kb6 31 Bc5+ Kc7 32 Ba7+ Kb7 33 Nd6+ Kxa7 34 Nxe8 Nxf4. It is mate in five (35 Rc7+ Kb6 36 Rb1+ Ka5 37 Rc2, etc.). 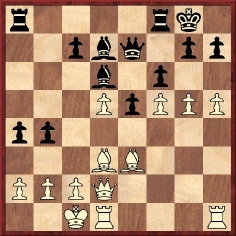 Here Leonard announced a less-than-obvious mate in five beginning with 31 d7. The most games Leonard played blindfold was ten, the first such occasion being on 16 November 1861. 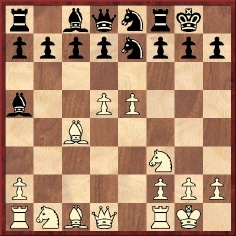 White mated in two moves. In the following century the score was published by Claudius Hüther (Schnell Matt!, page 100) and by Kurt Richter (666 Kurzpartien, page 10 – he called it ‘a text-book example of the power of double check’), without any date, giving ‘J.A. Leonhard’ [sic] as White and with no identification of Black, who was James’ brother, Joseph. The latter was described by Hazeltine (on page 368 of the December 1881 Brentano’s Chess Monthly) as ‘a nice, good-natured, rollicking boy, vehemently devoted to three laudable objects – Muggins, the Morphy Chess Rooms, and his brother’. 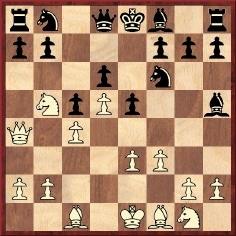 27…h5+ (A computer suggestion is this unusual variation: 27…Rf4+ 28 Kxf4 Qh4+ 29 Kf3 Rf2+ 30 Ke3 Qf4+ 31 Kd3 Rd2+ 32 Kc3 Qe3+ 33 Kb4 Rxb2+ 34 Ka4 b5+ 35 Qxb5 Rxa2+ 36 Kb4 a5+ 37 Qxa5 Rb2+ 38 Kc4 Rc2+ 39 Kb4 Qd4+ 40 Kb3 Qb2+ 41 Ka4 Qa2+ 42 Kb5 Qd5+ 43 Ka6 Qa8+ 44 Kb5 Qb8+ and wins.) 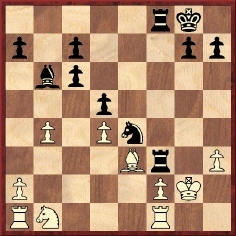 28 Kxh5 Re5 29 Rf7 g6+ 30 Kxg6 Rg8+ 31 Kf6 Rexg5 32 Qxg5 Rxg5 33 Kxg5 Qd2+ 34 White resigns. Leonard came onto the chess scene just as Morphy was easing himself out of it. On page 262 of his biography of Morphy, David Lawson stated that in New York in October 1860 ‘Morphy met J.A. 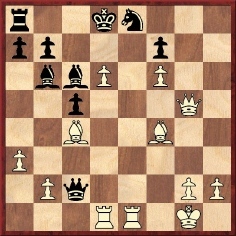 Leonard and Otto Michaelis, offering both the queen’s rook’. (The game, which has not been found, was drawn.) 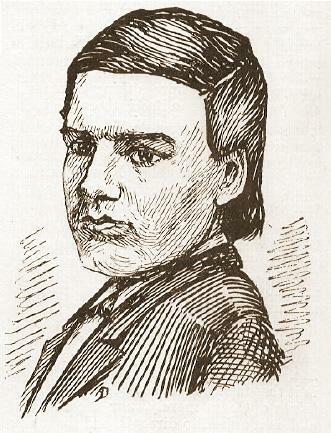 Leonard played most of his chess in New York, although he did visit Philadelphia in 1861 for a match against William Dwight (1831-1888), who later became a General. With Leonard leading by +6 –3 =2 and requiring only one more win, the match was left unfinished and he returned to New York. In Brentano’s Chess Monthly, December 1881, page 369, Hazeltine recalled that Leonard’s ‘favorite pupil’, E.W. 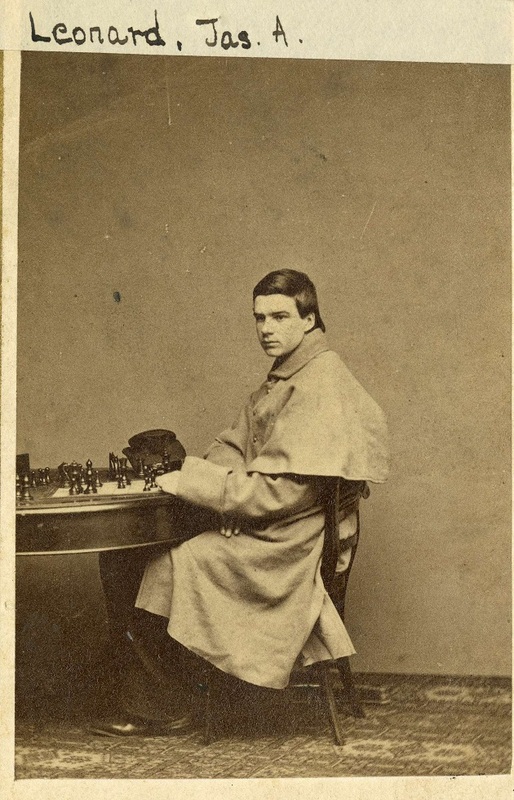 Bryant, ‘never tires of recording Leonard’s games, or of taking lessons from him, or of penning his praises in his letters’ and that ‘the chess world is indebted to him for the score of many of his young master’s games, which would otherwise have been lost’. 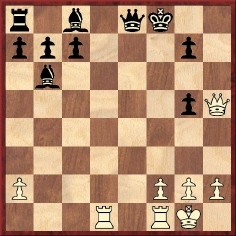 29...b1(N)+ 30 Bxb1 Rb2+ 31 Bc2 Rxc2+ 32 Kxc2 Bxf5+ 33 Kc3 Qxf6 34 Qxh7+ Bxh7 35 Rhxh7 mate. 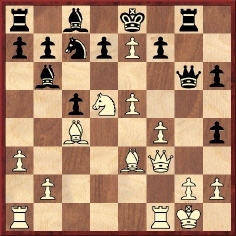 24 Rd8 Qxd8 25 Qh8+ Ke7 26 Qxg7+ Ke6 27 Re1+ Kf5 28 Qf7+ Kg4 29 Qf3+ (29 Re4 mate.) 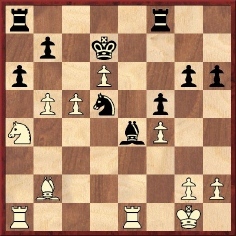 29...Kh4 30 g3+ Kh3 31 Qh5 mate. We are still looking for a good, proper-sized version. The chess historian is a free agent who may go wherever he pleases, constrained only by the wish, and need, to present something fresh. If his specialty is biography, for instance, he may choose to focus on a well-known master, but will then delve deeply, going far beyond the well-trodden path. Alternatively, and sometimes even more satisfyingly, he may select a figure never previously accorded full-scale biographical treatment. Until recently, the name of James Leonard was unfamiliar to most chess enthusiasts. 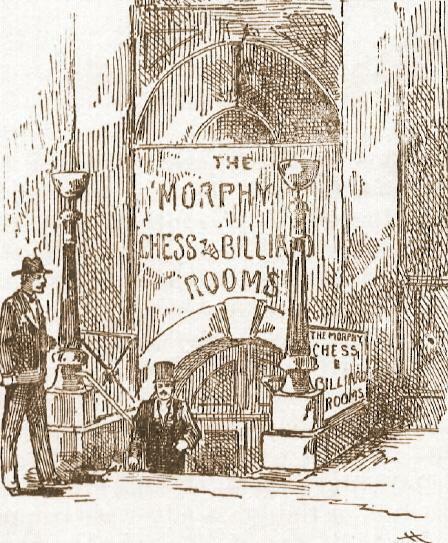 There were occasional references in passing to a brilliant young blindfold expert viewed as a possible successor to Paul Morphy, but scant particulars were readily available about him. His name did not appear in chess encyclopedias, and his games were absent from books and databases. In the late 1990s, Leonard began to receive recognition, although it could hardly have been imagined or hoped that, within just a few years, he would become the subject of a comprehensive monograph. That such a book has now come about is, of itself, testimony to the skill and drive of Dr Hilbert, who has investigated Leonard with his usual thoroughness, reliability and even-handedness. In so doing he has unearthed a remarkable amount of information and many fine forgotten games. There emerges a portrait of an engaging, talented chess lover who could indeed legitimately aspire to fill the gap left by Morphy’s withdrawal, at least in his homeland and possibly beyond. 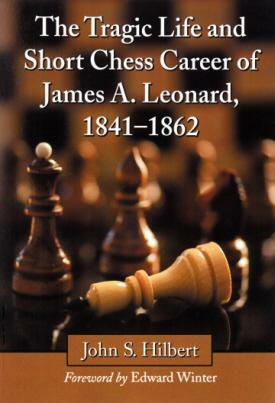 Yet while Leonard remains the focus of attention in these pages, the broader tableau of US chess in the early 1860s is also ably presented. So too is the agony of the Civil War, which cost Leonard his life. It is curious to reflect that, in other circumstances, James Leonard might still have been in active play during the First World War. After all, J.H. Blackburne, another blindfold specialist, was born the same year as Leonard and participated in the St Petersburg tournament of 1914. But Leonard, fêted in his teens, was dead at 20. 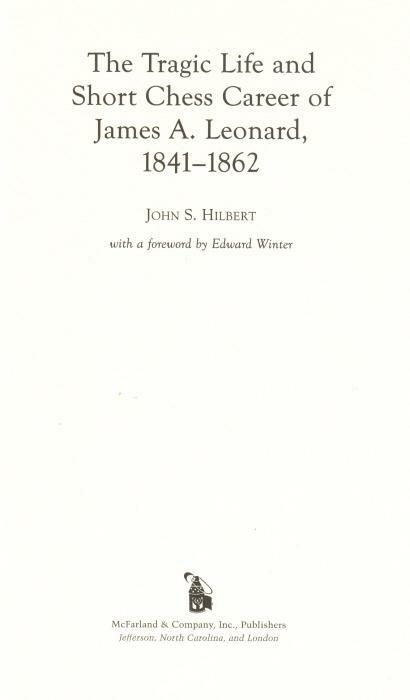 Almost a century and a half later, Dr Hilbert has paid him a magnificent tribute. In 2014 McFarland published a paperback edition. Concerning the ‘Sneak’ opening reference attributed to Leonard, see C.N.s 8368 and 8386. Latest update: 30 November 2017.